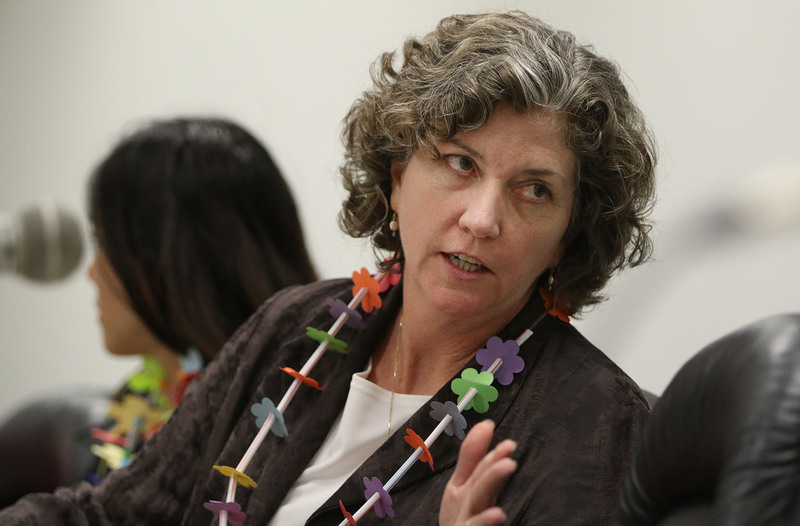 UPDATE: The Senate Water and Land Committee votes to oppose the appointment of a development lobbyist as head of the Hawaii Department of Land and Natural Resources. Minutes into the second day of Carleton Ching’s confirmation hearing, Gov. David Ige stood up and interrupted the proceedings to defend his nominee in the middle of a tough line of questioning from Sen. Laura Thielen. “I don’t quite understand what this question has to do with the confirmation,” the governor told his former Senate colleague in front of a packed hearing room. But Ige couldn’t save his nominee to head the state Department of Land and Natural Resources from rejection hours later as Senate Water and Land Committee members voted against recommending his approval. Carleton Ching listens to Senate Water and Land Committee members explain their votes on whether to recommend his confirmation as head of the state Department of Land and Natural Resources. The vote was 5-2, with Sens. Thielen, Gil Riviere, Maile Shimabukuro, Russell Ruderman and Les Ihara opposing the nomination and Sens. Brickwood Galuteria and Sam Slom supporting it. The nomination still goes to the 25-member Senate, where it could meet a different fate. In perhaps the hearing’s strangest moment, Ihara said his vote against Ching on Thursday would become a vote in favor of the nomination when it matters most on the Senate floor. That vote could come as soon as next week. The Senate is required to give at least 24 hours’ notice before taking it. Thielen, the committee’s chairwoman, said she didn’t see in Ching a commitment to and understanding of the constitutional rights that he would be expected to protect and defend in the position. She read notes from the 1978 constitutional convention describing the rights of cultural practitioners and the protection of natural resources. Committee Chairwoman Laura Thielen questions DLNR chair nominee Carleton Ching on the second day of his confirmation hearing. In a press conference after the hearing, Ige appeared defiant as he emphasized his commitment to Ching, a lobbyist for developer Castle & Cooke. The governor said he wasn’t surprised by the committee’s vote. “That committee is usually filled with people who are conservationists and protectors of the environment by the nature of those members who would seek to serve on that committee,” Ige said. He was frustrated with lawmakers’ questions about various positions taken by the Land Use Research Foundation, a pro-development lobbying group that Ching has been president or vice-president of for nearly a decade. 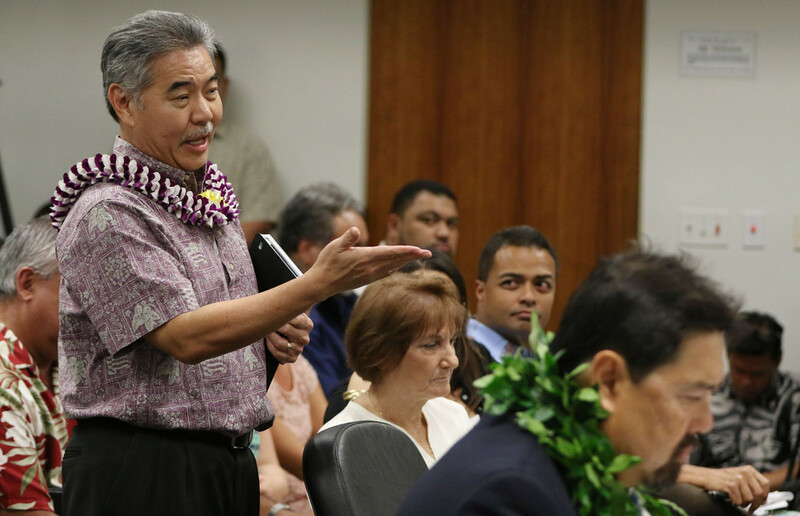 “I am very much concerned about the guilt-by-association perspective of the committee,” Ige said. He said he thought it was unfair to “hang a label on a person” and didn’t think that most of the senators understood the minutia of the questions that they were asking Ching. He took a shot at Thielen’s closing remarks. “We do know that this department is most important and I don’t need to be cited (about) what the constitution provides,” he said. Ching said the hearing’s result didn’t shake his resolve to serve. While Ching didn’t earn the recommendation of the committee, the full Senate may still confirm him. Sen. Ihara from Kapahulu-Kaimuki, who voted Thursday against Ching’s nomination, said he plans to vote in favor of it in the full Senate vote. Ihara said Ching lacks qualifications and doesn’t have a track record to prove his commitment to conservation. 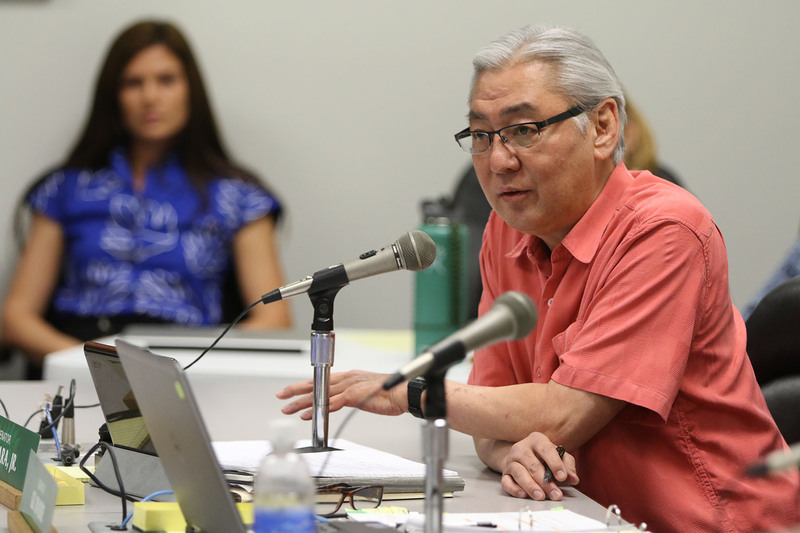 Sen. Les Ihara questions Carleton Ching during the second day of his confirmation hearing. “If this was a job interview and we had a few selections, I would not select you,” Ihara told Ching. But he said that the Senate process of deciding whether to consent to the nomination is different from a job interview. He called picking Ching “risky” but emphasized that he trusts Ige. It may also be risky to defy the governor so early in his term. Ige has been a close colleague of many lawmakers, and they want him to succeed. Political activist Bart Dame, a critic of Ching and member of the Progressive Democrats of Hawaii, said Ihara’s stance makes it easier for the full Senate to discount the committee’s recommendation. “That was disheartening but I think it was reflective of the kinds of pressures that are being brought to bear (on lawmakers),” Dame said. He said he thinks it is “more likely than not” that the full Senate will vote to confirm Ching. Thursday’s hearing revealed vastly different opinions among the senators on the committee as to whether Ching is qualified to lead. Galuteria said he decided early on to support Ching and nothing said in the hearing changed his mind. Gov. Ige interrupts Sen. Laura Thielen’s questioning of DLNR nominee Carleton Ching. Apart from Thielen, the gravest concerns on the committee were expressed by Ruderman and Riviere. 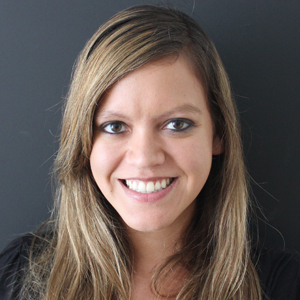 Ruderman, from the Big Island, compared Ching to appointees to the Attorney General’s Office and Department of Public Safety that the Senate confirmed earlier Thursday. Riviere said Ching evaded some questions and didn’t answer others to the depth the senator would have liked. Riviere said he had to vote against Ching’s nomination to properly represent his district, which stretches across the North Shore from Kaena Point to Kaneohe. Ching’s responses to senators’ questions Thursday were no less vague than during the hearing’s first day. He answered questions with his own questions, and often seemed unfamiliar with the department he’s seeking to lead. Riviere was frustrated by Ching’s responses to questions about a proposed Kahuku wind farm that is opposed by many of his constituents. The senator said Ching would likely have to review an environmental analysis of the project if he is confirmed. Ching said he wasn’t familiar with the issue, but would listen to community members’ concerns. “You have to be real sensitive to their needs, but are they seeking solutions to their concerns or is it just a no?” Ching said. Riviere also asked about Ching’s involvement in Castle & Cooke’s efforts to place wind turbines across a fourth of Lanai. The controversial project could resurface in a few years. “What would be the benefit for the people of Lanai for giving up one quarter of their island?” Riviere asked. “I don’t think they were giving up anything, I think they were going to gain,” Ching said, mentioning the potential to lower electricity costs. Ching was asked how he would respond if a Castle & Cooke proposal were before the Board of Land and Natural Resources. “If there’s any appearance of conflict, I don’t mind recusing,” he said, but he added that he would deal with the issue on a “case by case” basis. He said he saw no harm in working with Castle & Cooke during the initial stages of a proposal. The panel’s decision to oppose the nomination was unusual but not unique, according to local political analyst Neal Milner. What’s more unusual is that the governor started his first term by picking a nominee who he knew would be controversial. “He had to know he was going to have a lot of opposition and for the life of me, I don’t understand why he did it,” Milner said. Milner also was shocked by the governor’s decision to stand up and interrupt the legislative process to defend Ching. “He’s acting a lot like Neil Abercrombie on his bad days,” he said. The governor’s nomination and staunch defense of Ching has baffled some environmentalists who campaigned for Ige when he ousted then-Gov. Neil Abercrombie last year. The governor wouldn’t say Thursday whether he thinks Ching has enough votes to pass the Senate. Instead, he expressed confidence in the Senate process. 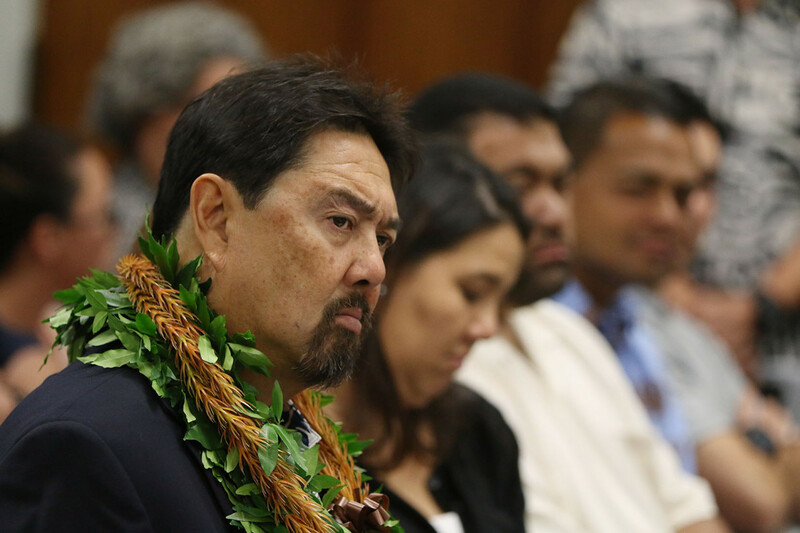 “We are committed to seeing the confirmation through,” Ige said.